Diadraw Air Camera is an Adobe Native Extension that allows you to capture static frames from the iPhone/iPad video camera at a chosen frame rate and resolution. It is possible to choose whether to lock the focus, exposure or white balance or to have them done automatically by the camera. It is also possible to set a point of interest to expose for or to focus on. The extension also allows you to rotate, crop or translate frames. 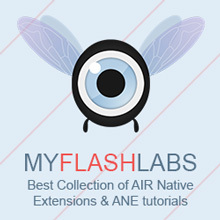 Air Native Extension, iOS New BSD. URL.